Afghan ground forces will be barred from calling in NATO air strikes after an attack killed a number of children this week, President Hamid Karzai said Saturday. This was apparently a reference to an attack during an overnight raid by combined Afghan and NATO ground forces on a Taliban hideout in a remote eastern region on Wednesday. Three Taliban commanders, including a notorious Al-Qaeda-linked militant leader called Shahpoor, were also killed in the raid, Afghan officials said. Civilian casualties caused by NATO forces fighting Taliban Islamist insurgents are a highly sensitive issue and are regularly condemned by Karzai. Karzai said Afghan forces would be able to defend the country after the foreign troops withdraw. "And fortunately, we will show to the world that we can protect our country, and we can defend our country." More than 3,200 NATO troops, mostly Americans, have died in support of Karzai's government in the 11-year war since the Taliban were ousted by a US invasion in 2001, but relations between the president and the US are often prickly. 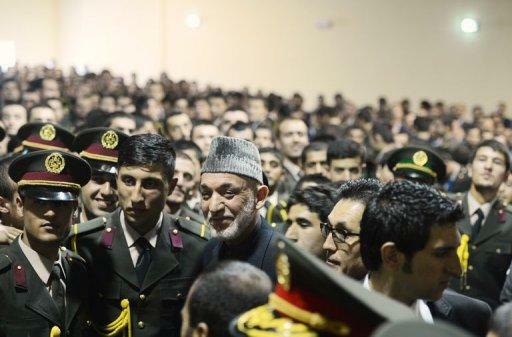 Afghan army officers with President Hamir Karzai (centre) at the National Miltary Academy in Kabul today. Afghan ground forces will be barred from calling in NATO air strikes after an attack killed a number of children this week, Karzai said.